What does H.Moser & Cie’s latest watch have in common with someone falling into a pit created by Anish Kapoor at Porto’s Serralves Museum? Kapoor’s ‘Descent Into Limbo’ is an eight-foot deep pit, the inside of which the artist painted with Vantablack®, making it simply look like a painted black circle on the floor. It is no surprise that despite the presence of a guard (who seems not to have been there at the time), someone decided to step ‘on’ it. One could also ask why it was necessary to dig such a deep hole if it’s going to look bottomless regardless of its depth, but that’s a question for Kapoor. Some reports at the time of this accident made reference to Kapoor having the worldwide license to use Vantablack® in works of art, but it turns out that he only owns the license to the original carbon nanotube-based version (Vantablack S-VIS); the company later released a non-nanotube version (Vantablack VBx) which anyone can use. H. Moser & Cie have taken their Endeavour Perpetual Moon Concept, with its unadulterated dial, and ramped it up several notched with the use of Vantablack® coating. As the Kapoor incident shows, the darkness and attributes of this coating are deceptive to the eye (and also make for a difficult dial to photograph). It’s pretty much as black as one can get, and it is for this reason that Moser have chosen to use it for a moon-based model. So why is it so black? As mentioned earlier, Vantablack® is composed of carbon nanotubes. These are lined vertically next to each other and are capable of absorbing 99.965% of light. 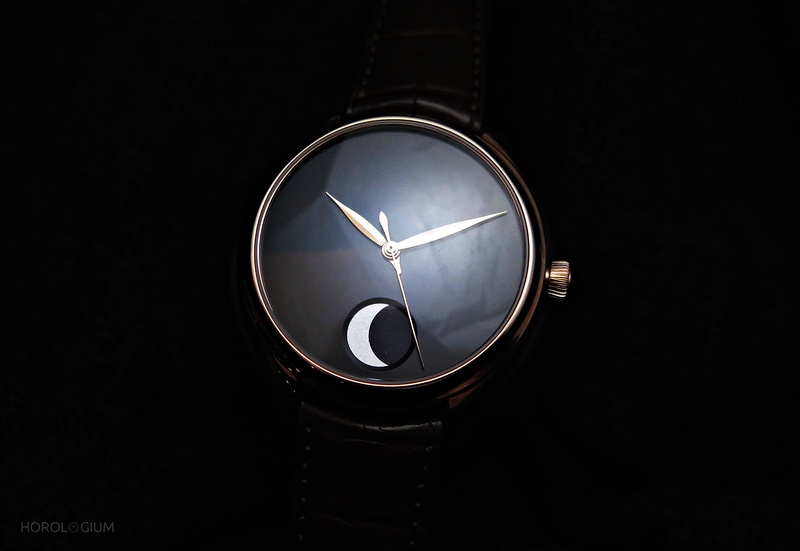 To look at, the dial is an expanse of black that is distinctly different from others. It is eye-catching and intriguing to look at, even on such a small surface (relative to a Kapoor work). As for the watch itself, it’s in a 42mm stainless steel case. Inside is the manual wind Calibre HMC 801, equipped with an interchangeable Moser escapement featuring gold screws. It beats at 18,000VPH and has a seven day power reserve, for which there is an indicator on the movement side. 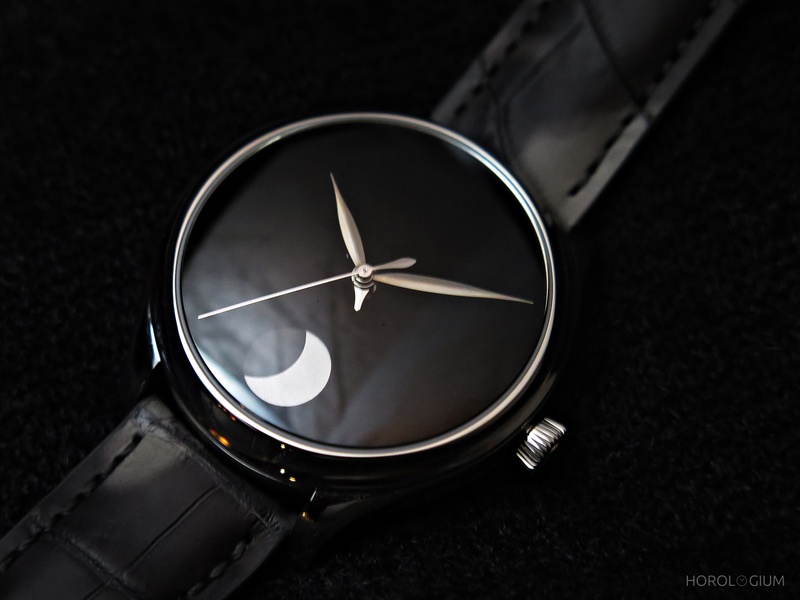 The Endeavour Perpetual Moon Concept is out by one day after 1027.30 years, and you can adjust the moon phase via a pusher on the side of the case. Coming in a limited edition of fifty pieces, the RRP is CHF 35,000 including tax. For those who keep a close eye on the GPHG, you will have noticed this watch on their site before its official launch. For those who not only follow the GPHG but are also fans of Anish Kapoor, you may also be aware of this piece, although it is quite a different watch, with the full Vantablack® experience not playing centre stage.